Into The Night Photography: What Do The Northern Lights Actually Look Like? What Do The Northern Lights Actually Look Like? While observing the aurora is a truly awe-inspiring and often breathtaking experience, the images that come out of modern day DSLR cameras do not match what you witness in real life. I've photographed many colors in the fantastic Northern Lights displays I've been lucky enough to observe including green, purple, yellow, orange, red, magenta and blue. But I never REALLY know what color they are unless I'm looking at my camera's LCD screen or more importantly viewing these images on my computer. Why? 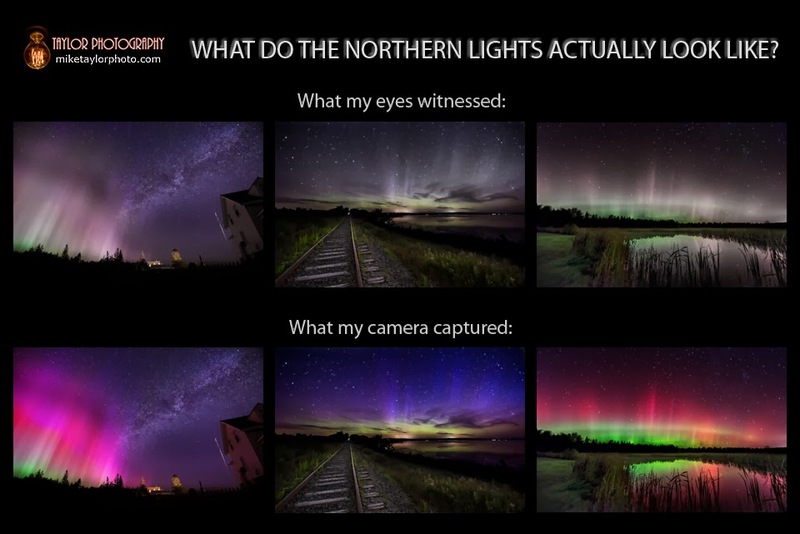 The simplistic answer is because human eyes can't see the relatively “faint” colors of the aurora at night. Our eyes have cones and rods – the cones work during the day and the rods work at night. Thus the human eye views the Northern Lights generally in “black & white.” DSLR camera sensors don't have this limitation. Couple that fact in with long exposure times and high ISO settings of modern cameras = the camera sensor has a much higher dynamic range of vision in the dark than we do. 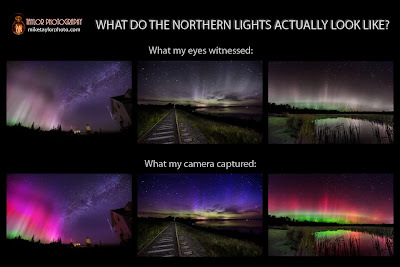 The same thing is true regarding the Milky Way and night photography in general. Some folks claim that they can see many colors during an aurora display and that very well may be. I have definitely seen light shades of green, red, and violet/purple but I can only speak for myself and my empirical knowledge - your mileage may vary. The farther North your viewing location, the more colors you can actually see because the aurora is stronger. I made the [above] graphic to show what I mean. These three photographs exemplify the most impressive aurora displays I've seen. The top row of images have had the skies desaturated by color (green, yellow, red, magenta, purple, blue) to show what I saw with my eyes. A bit of green has been retained on the horizons and just a bit of the color that I remember seeing above that – red, violet, and red respectively. FYI - I generally set the white balance on my camera to Kelvin 3450 - 3570 when shooting the features of the night sky but I will also take a few frames with it set on Auto to see what colors the camera thinks it should be capturing. Most times I end up going with the Kelvin setting, which is a little bit on the cool/blue side of the spectrum. The EXIF data for these shots are K-3450, K-3570, K-3570 respectively. I process all my photos through Lightroom 4 & Photoshop CS5 and I certainly have an “artist's view” when bringing an image to life but when it comes to these strong aurora scenes, the colors have not been saturated very much because Mother Nature did that work beautifully. I saw “dancing lights” in the sky, spiking straight up starting around a few hundred feet off the ground. They waved a bit like curtains but stayed in basically the same area. They seemed to be kind of a blur though, the “spikes” were not very defined. There was definitely a green hue on the horizon and a bit of red color above that but I didn't see the crazy red & magenta colors that my camera recorded. I saw what appeared to be white/grey “curtains” dancing along the black sky. I didn't see much of anything but I set up, started shooting and immediately saw green on the horizon on my camera screen. I set the camera to shoot 30 second exposures for an hour with just a few seconds in between so that I could quickly review the scenes on the LCD screen as my camera snapped away. Within 10 minutes or so, I saw sharp spikes or columns shooting up and slowly moving across the sky. To my eye they appeared to be a light violet/purple color enough that I actually posted a status update to Facebook at 2:24 AM that said “You know the aurora is cranked up when you can see the purple spikes with your naked eye.” When the display died down, I quickly looked through my images but I didn't really know the spikes were blue until I viewed them on my computer. The most impressive oval I've ever seen, a perfect arc which covered the Northern sky's horizon. The tallest and most crisp “spikes” I've witnessed, reaching all the way to the stars. Again I saw definite green around the oval at the horizon but the spikes themselves were white/grey, not the intense red that my camera captured. The intensity of the aurora always ebbs and flows, sometimes it is quite strong and other times it is mild. If you can see a simple glow or swirling lights on the horizon and/or “spikes” shooting into the sky that look like spotlights and/or “curtains” of light – pay attention and/or be patient. The display can last just a few minutes, a half hour, or longer. Most of the intense shows I have witnessed in Maine, USA have lasted right around a half hour. 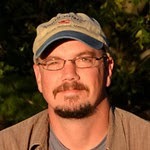 Mike Taylor operates Taylor Photography and an imaging studio out of a 19th Century farmhouse in central Maine. He's been a scenic and nature photographer for over 10 years, and a studio photographer for seven years. Beside being an artist, he's also a philosopher, musician, movie buff, and a self-proclaimed connoisseur of beverages made from malted barley and hops ("We all have our bag of rocks to carry," whips Mike.) You can fine more of Mike's images on his website, Facebook, Google+, and Pinterest. His night photography workshop schedule is on his blog. Thanks for the interesting article on the northern lights. I have never heard that about the black & white sensory experience and have always seen the aurora in color (lucky me!). I saw the lights most dramatically a long time ago in northern Minnesota. They started as distinct strings of light with variable color and then elongated across their width in to dancing, colorful points strung out across the sky. THanks for the info but unfortunately i didn't see that yet ;( love to see it with my wife and kids together. looking forward to visit there soon. The video testimonial script is the website that has information about all video expert testimonial makers. wow. that's so great post . This particular fundamental reason for training would be to enhance the ethical degree of people that they'll realize negative and positive as well as may enhance the budget. In the event that individuals informed No anchor link they are able to generate much more as well as wealthy therefore we offer high quality training support. Fundamental reason for training would be to enhance the ethical degree of people that they'll professional capstone project writing service realize negative and positive as well as may enhance the budget. In the event that individuals informed they are able to generate much more as well as wealthy therefore we offer high quality training support. Glad to know this information. APA style research paper writing is still an expert design of writing. It might also be called a distinct standard format that's followed for writing research and academic newspapers. useful link you can trust for the quality of writing. If you want to be a scientist you should select the Turbia University because they give the best information about the science and related things but doctoral dissertation provides authentic info. This university has everything that students want. This is the world best university and standard of the study is so great. APA type study papers creating remains a professional layout regarding creating. It could furthermore become referred to as a distinct common file format which is http://www.bibhelper.net/asa-annotated-bibliography-writing-and-editing/ implemented regarding creating study and also school magazines. beneficial website link it is possible to rely on regarding the grade of creating. Very nice blog. Photos are so amazing. I really liked it. Gondwana Ecotours is best for providing Northern lights photo tour in alaska. so plan a trip to see the northern lights. The scope of this blog is not just about my photography. It regularly features the night vision of many other photographers. 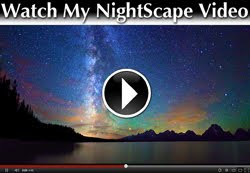 You'll also find tips, tutorials, and reviews on equipment, software, and books related to night photography.